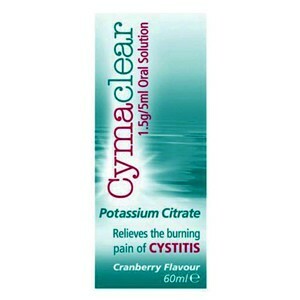 An oral liquid for effective, symptomatic relief from the burning pain of Cystitis and mild urinary tract infections. Potassium Citrate, citric acid, monohydrate, quillaia tincture, cranberry flavour, ethanol, chloroform, purifiedwater and syrup. Adults, the elderly and children over 6 years:Shake the bottle thoroughly before use.Fill the dosing cup provided to the 10ml mark.Stir into a glass ofwater.Drink the diluted medicine 3 times a day after meals.Children under 6 yearsDo not give to children under 6 unless your doctor tells you to.If you take too muchIf you accidentally take too much, see a doctor straight away. Take the pack with you to show which medicine you have swallowed. Thank you for your interest in Cymaclear Oral Solution Cranberry Flavour. Enter your email and we'll contact you as soon as it's available again.